This page is for some miscellaneous bits & pieces about the Little Eaton area. There is a much more detailed history of the Ripley Branch elsewhere on the web site. The thing about Little Eaton Village Crossing that always intrigues me is why no-one ever seems to have questioned the need for such a bloody long name! Especially not in LMS days when they decided to put the name on the ends, doubling the amount of letters needed and making a name board which was nearly wider than the box. It can’t have been to ensure all concerned knew the name of the settlement they were passing through; no one is going to get lost on a branch with a speed restriction that is slower than a galloping hose! And anyway, if that was the purpose of signal box names, how would they explain “Perrin & Harrison’s Sidings” or “LNW JCN” for example!? I'm not expecting an answer, of course, just ranting! On the recommendation of the Engineer, ordered that the following signal boxes be renewed; _Little Eaton Village Crossing... estimated cost £250. . It was a block post on the single line at that time, though the only necessity I can think of for it to be so would be that it would allow a train to approach from Coxbench (which was a block post until 19JUL1903) while a movement into or out of Dowdings Paper Mill was going on at Little Eaton Station. The post was downgraded from a Signalman post to a Crossing Keeper post from 19NOV1903 (RAIL491/1026 page 475) so the assumption is that it ceased to be a block post at that time. The timing has to be related to the abolition of Coxbench with the downgrading of the connection into Bean & Slater’s Quarry to a stage released by the token (and removed altogether on 27JUN1909). The irony of all that though seems to be that the job would be tied-up even longer with the block section being from Kilburn. I guess it was cheaper though! 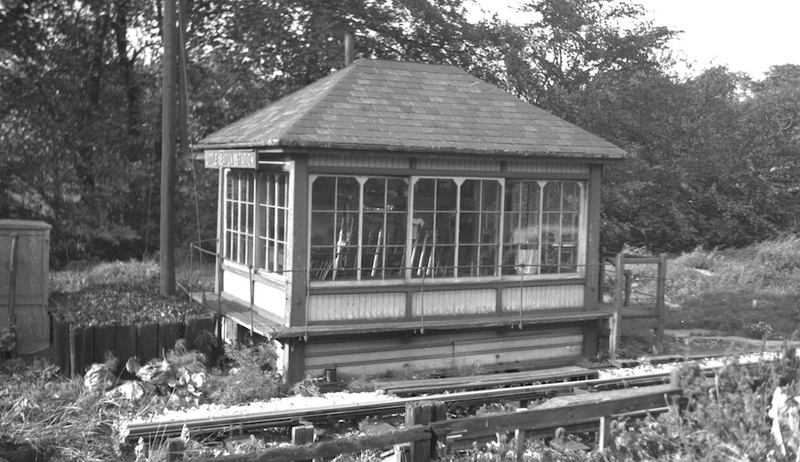 In other words, had they hung on a year, the MR would have got away with a Holbrook Crossing style hut there instead of a £250 signal box that, despite its diminutive proportions, was still too big for the job it did. I’ll bet generations of crossing keepers cursed those steps! 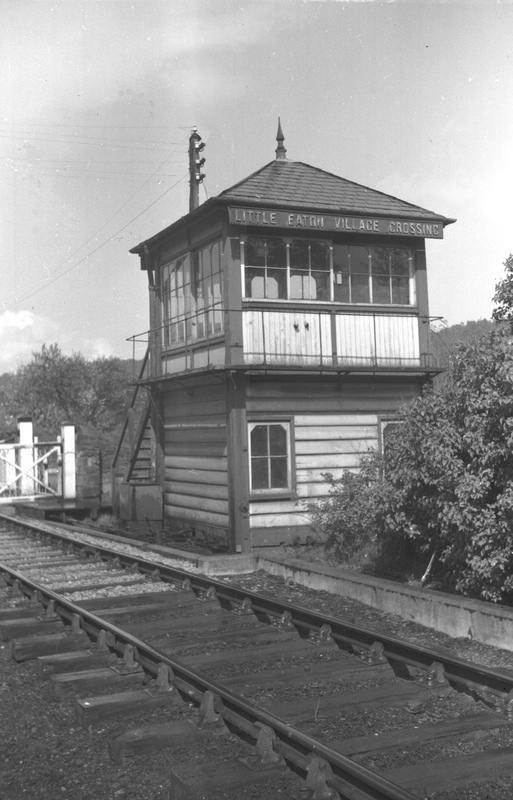 This signalbox is in the course of restoration by Kevin Thomas in Stone, Staffs. Along with the timber and glass which goes to make up the box, Kevin also acquired a Train Register from the box for early 1965. The register gives us a insight into day-to-day operation of the box in the mid-1960s. By that time it was a two man turn with Messrs F.V.Taylor and J.Pynegar being the regular men with B.E.Brown and E.A.Fox-Holmes signing-on as reliefmen periodically. Whilst the early man worked a full shift of 0600x1400, the late turn man would book-off most evenings by 1730. On Saturday 10th April 1965, Signalman F.V.Taylor was on early turn. Working No. 8370 was shunting in Dowdings Paper Mill. 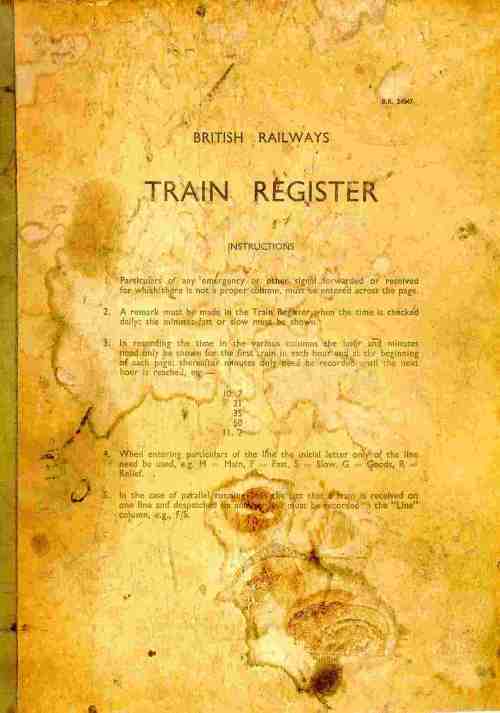 The entry in the register reads; “ Engine pony riding clear of rail when drawing out at 8.00hrs ”. Obstruction Danger was sent to Kilburn Crossing and Little Eaton Junction at 0808hrs. The P-Way men couldn't have taken long to do their stuff as 2-1 was sent to Little Eaton Jn at 1031hrs. The engine had been rerailed and departed for Little Eaton Jn at 1114hrs. 2-1 was sent to Kilburn at 1117hrs. A subsequent entry (in red) announced that with effect from 1205hrs 10th April 1965; “Dowdings Siding not to be used until permission given by Signal and Telegraph Dept. No.8 points clipped to lie for single line”. No. 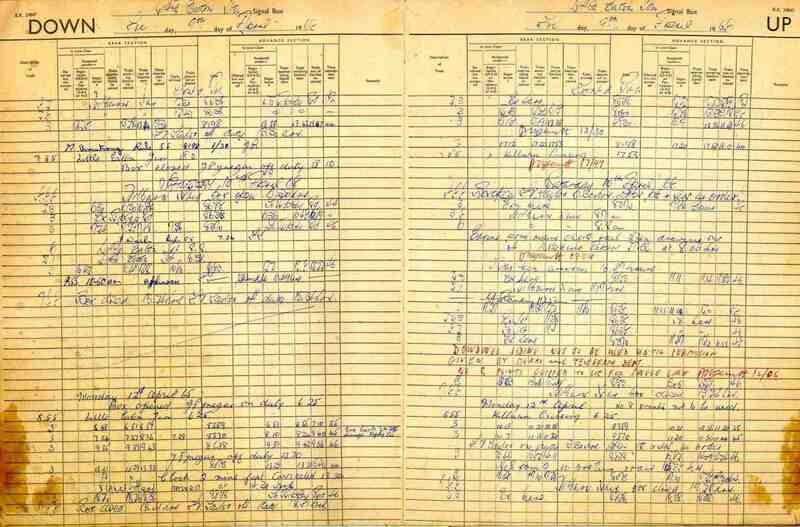 8 points were recorded as being back in working order at 1335hrs Monday 12th April 1965.